Virginia Union University received a B.
Washington Monthly's ranking of 71 out of 346 of Baccalaureate Colleges - Overall Rank was a major contributor to this grade. 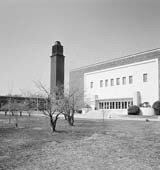 Virginia Union University is a Baptist-affiliated, traditionally African American school in historic Richmond. Twenty-two Virginia Union University alumni have served as college or university presidents, including CEOs at Chicago Theological Seminary, Fisk University, and Virginia Union University. Former Virginia governor Douglas Wilder is also a VUU grad. What are the top 3 reasons someone should attend Virginia Union University? What is a typical Virginia Union University student like? Describe the type of person that should attend Virginia Union University. a typical VUU student are Friendly, outgoing students who aren't afraid to show school spirit at any event and tends to be invovled in all of the schools organizations. Virginia Union University was founded in 1865 to give newly emancipated slaves an opportunity for education and advancement. The University is the result of the merger of four institutions: Richmond Theological Seminary, Wayland Seminary, Hartshorn Memorial College, and Storer College. Richmond Theological Seminary held classes in Richmond, Virginia at Lumpkin's Jail, a former holding cell for runaway slaves. During the same time, Wayland Seminary was founded by the American Baptist Home Mission Society in Washington, D.C. Two years later in 1867, Storer College was founded in Harper's Ferry, West Virginia, and in 1883, Hartshorn Memorial College opened its doors in Richmond as the first college for African American women. After three decades of operating independently, Richmond Theological Seminary and Wayland Seminary merged on February 11, 1899 to form Virginia Union University. Later, in 1932 and 1964, respectively, Hartshorn Memorial College and Storer College became part of this UNION. What are the top 3 things that students do for fun at Virginia Union University? The top three things students do for fun at my school would be, hangout in the student game room,sing ,and hangout in the square. Campus housing is available for undergraduates. Housing deposit : $250.00. Housing deposit due : Jul 1. Freshman allowed to have car. No pets. 7% of students graduated in the top tenth of their class. The average student pays $19,267 for tuition, fees, and other expenses, after grants and scholarships. Total stated tuition is $13,614, in-state and on-campus, before financial aid. Learn more about financial aid at http://www.vuu.edu/financial_aid.aspx. Estimate the net price for you at http://my.vuu.edu/ics/myvuu-home.jnz?portlet=net_price_calculator. Virginia Union University participates in the NCAA Division II for college athletics. Want more info about Virginia Union University? Get free advice from education experts and Noodle community members.